One fine morning we woke up to a tweet from Packt Publications – Consider yourself a pro with FusionCharts 3.2? Why not write a FusionCharts 3.2 Beginner’s Guide for Packt? Somebody wanted a book on the software we created and have been working on for a decade… that was BIG! We were super kicked about it. We thought we will drop in a quick line to the publishers saying we would be happy to review the book and be of help with the book in general. A couple of emails and phone calls with the publisher, we decide that we will write the book ourselves (it’s our software after all) and it would be the official guide to FusionCharts Suite. Here we are, after a year of planning, writing, rewriting, proofreading… all in all a lot of hard work to bring to you “FusionCharts Beginner’s Guide: The Official Guide for FusionCharts Suite”. Enough of the history. Tell me about the book. This book is both for beginners and advanced web developers who need to create interactive charts for their web applications. 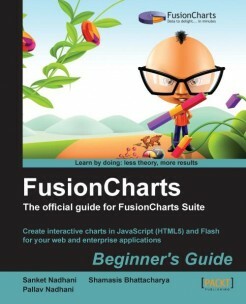 It is a fast-paced yet comprehensive guide to FusionCharts Suite filled with examples and practical tips, and no previous knowledge of FusionCharts Suite is assumed. You can take a look at the complete table of contents on the Packt website, and even download the first chapter, ‘Introducing FusionCharts’, for free. New Zealand to Brazil, and domains as varied as manufacturing tools to stock tickers. And now we are bringing all that learning to you. The book was a big project for us and we quite like the way it has come out. But then there is only so much boasting we can do on our own. We would love to know what you think of the book, either here in the comments or in the reviews at Amazon, or Packt’s website. Happy learning!